LG today introduced the HT902TB, a home cinema system designed to act as a home entertainment hub in your living room. Packing a hefty 1,000 watts of audio power, LG says this system is both feature-rich and practical - and it could be right. 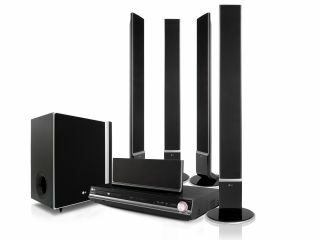 It's basically a home speaker system which comes with an amp, subwoofer and DVD player, designed to hook up to an LG television. The HT902TB includes an XTS Pro Digital Amplifier, which balances both high and low tones for a clearer sound. And it also features Virtual Sound Matrix (VSM), which creates five virtual speakers to replicate a 10.1-channel sound effect, allowing the sound to travel more smoothly around the room. As well as listening features, the HT902TB also shines with its connectivity. The system has HDMI connectivity with 1080i up-scaling technology and portable audio 3.5 Stereo In to plug in devices such as MP3 players. There's also a USB port to share music, photos and video files in DivX format. The Simplink (HDMI-CEC) function allows you to operate your LG television and AV system with the same remote control. And with the DVD player you get the expected list of compatible playback formats; DivX, DVD, DVD-R, DVD+R, DVD-RW, DVD+RW, WMA, MP3 and JPEG. The HT902TB will be available in the UK from this month.